Don’t overlook any aspect of your home’s remodel or renovation thanks to the professional and passionate team at RF Bathroom & Kitchen Products. With our kitchen sinks Melbourne, Adelaide, Hobart, Brisbane & Sydney locals can enjoy the finishing touch that their kitchen has been missing. Stocking an extensive range of fresh and expressive kitchen components we aim to make your choice an easy and hassle-free experience, allowing you to complete your project safe in the knowledge of the quality of our exceptional products and accessories. Whether it’s for your home or office, the RF team can help you to find the perfect kitchen sink to match the size and needs of the space, providing a functional addition to your kitchen. We stock the right product for any project, from your busy family kitchen to your office breakroom. When you choose to work with an experienced and qualified team like ours you are making an investment in professional service and lasting quality. We are industry leaders when it comes to service and fast installation and ensure each of our customers receive a strong return for their investment. We only stock the very best in durable and stylish sinks, with a design and size to suit any kitchen, and competitive prices to match any budget. A top-grade sink will not only transform your home or office kitchen, it can help to boost your property value, with a well-designed kitchen being high on the wish-list for many prospective property owners. While there may be other ‘kitchen sink suppliers near me’, RF Bathroom and Kitchen Products offers unbeatable customer service and quality products that are guaranteed to provide years of service, becoming a centrepiece of functional style in your kitchen. 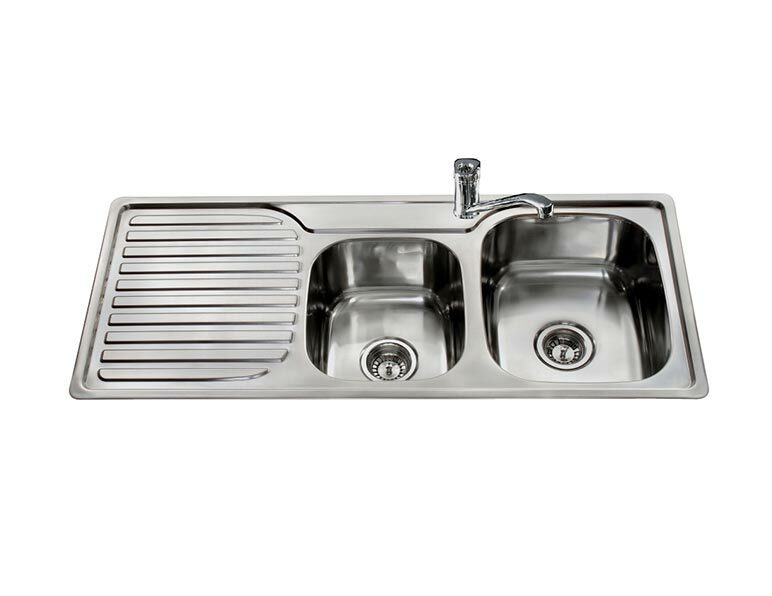 Made from durable materials, our sturdy and stylish kitchen sinks allow Adelaide, Hobart, Melbourne, Brisbane and Sydney homes to be complete. Add the finishing touches that really make a house a home with a quality Australian made product that will provide many years of enjoyment for you and your family. Make entertaining and cleaning up a breeze with large dual sinks. 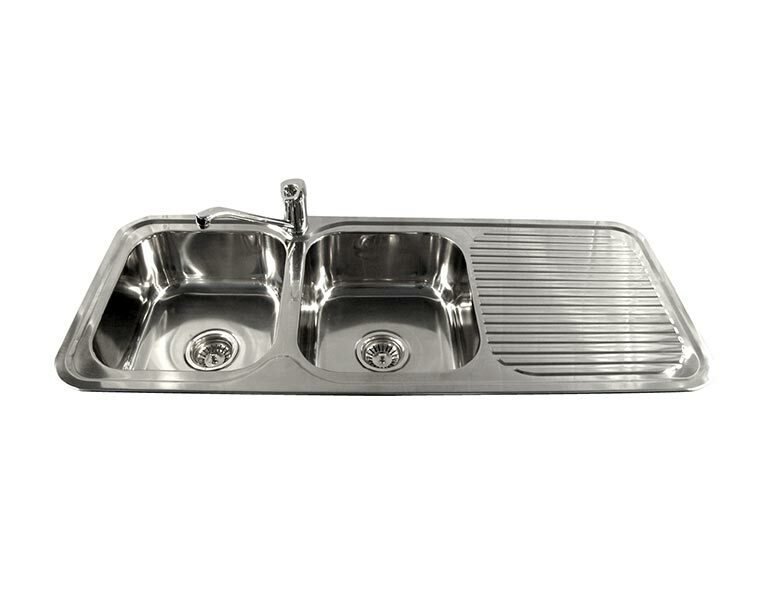 Cater to large family dinners with one of our generous double bowl and double drainer kitchen sinks. Sydney to Hobart, Brisbane to Adelaide to Melbourne, our products provide a practical and elegant solution for homes and businesses throughout the country. Our competitive prices mean this is luxury everyone can afford. Top it all off with a fitted timber chopping board, stainless steel draining basket or colander made to match the dimensions of your new RF kitchen sink. You will find all the technical drawings and specs right here on the website, so there is no reason not to start planning your new kitchen today. Whether it’s a small-scale kitchenette or the expansive entertaining space you have always dreamed of, we have styles and sizes to suit any kitchen and any budget. Retailers and builders can also find confidence in our product range with sinks and tapware their customers and clients will love. Our high-grade stainless steel is durable and easy to clean, making this a practical and healthy option for a range of applications. RF Bathroom & Kitchen Products are proud to supply both the Omnia Lifestyle Range and Matisse Luxury Range, so that all of our customers can find a product perfectly suited to their needs. To find out more about our wide range of kitchen sinks for Brisbane, Adelaide, Hobart, Melbourne and Sydney properties, and how they can benefit you, feel free to call us today on 03 9796 3969.